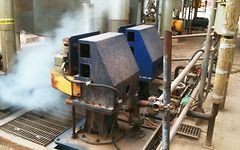 KSB's line of GIW® Minerals slurry pumps and systems deliver a lower total cost of ownership in chemical, FGD, steel mills, pulp and paper, and sugar. Whatever slurry application your manufacturing process requires, KSB has the pump to ensure critical process reliability. GIW® Minerals pumps are renowned for being the slurry solution. More than a pump manufacturer, KSB helps customers select the type, size and operating speed of GIW® Minerals pumps that perform best. Superior design and solid construction are our trademarks. That’s why, for more than 90 years, industries have been using GIW® Minerals pumps to keep them running. Visit the product catalog to find the optimum slurry solution. Since its inception, the IGCC market has chosen GIW® Minerals LCC slurry pumps for successful use and performance. KSB provides equipment and support for the Metal Refining, Steel, Fuel Storage Runoff, and Pulp & Paper industries. KSB offers the best chemical slurry pumps for your worst conditions. Abrasive sugar slurries can wreak havoc on pumps and equipment. Sugar producers rely on GIW® Minerals pumps to keep their systems running. The GIW® Minerals ZW pump provides performance and efficiency at great value.